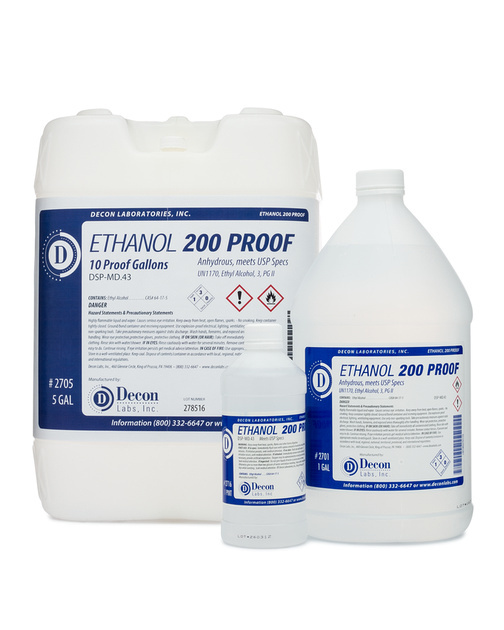 Decon’s Pure Ethanol 200 Proof is 100% absolute (undenatured) Ethyl Alcohol that meets USP and multi-compendial specs including EP, BP, JP. Used as a cleaner, solvent, or as a reagent. Our Ethyl Alcohol is packaged in convenient plastic, glass, and metal containers including pint, gallon, 5 gallon, and drum sizes. Pure Ethanol is a federally regulated product so applicable laws must be followed. Our Ethanol products are available tax-free to customers who hold a valid, TTB issued “Industrial Alcohol User Permit.” Also available tax-paid which has the federal excise tax included in the price, this version normally does not require a federal permit. For questions regarding Ethyl Alcohol regulations please contact Decon Labs.